With the release of the Grymkin faction Privateer Press also brought in a brand new mechanic, Arcana. Instead of a normal "feat" most Grymkin casters have a Personal Arcana, and they also get to chose 2 more at the start of each game. This puts 15 Arcana total into the game, 10 general and 5 Trumps. I'm going to go over them 5 at a time, giving tips on when to select them, how to trigger them, and yes how to play around them. So whether you play Grymkin or just trying to figure them out, hopefully this series will put some of your uncertainty to bed. Instead of feats, Grymkin warlocks have Arcana cards. Arcana cards can be played at any time during a game in accordance with the rules on the cards. Each of a warlock’s Arcana cards can be played only once per game. A warlock can play only one Arcana card per turn. There are two types of Arcana cards: regular Arcana cards and Trump cards. Each Grymkin warlock has one Trump card that can be assigned only to that warlock. The remaining Arcana cards can be assigned to any Grymkin warlock. Before either player’s deployment at the start of the game, a Grymkin player assigns each of his warlocks three Arcana cards and reveals those cards to the opponent. One of these three cards must be the warlock’s Trump card. 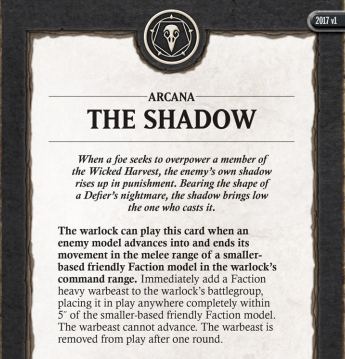 The other two cards can be any non-Trump Arcana cards, but each card can only be assigned to a single warlock in the army once. In other words, no duplicate Arcana cards are allowed within an army. Great so we have some basic knowledge about Arcana now. In Random Rules Article I go over the timing of Arcana selection. Today we'll be covering Accursed, Ruin, Ill Omens, The Shadow, and Fortune's Path. These are all General Trumps, in part 2 we'll finish the General Trumps and part 3 will cover the unique ones. I want to say one thing before we dig into each of these. The biggest mistake I see or hear about with Arcana is "I always take the same ones". A large appeal and one of the most incredible things Grymkin has going for it is their flexibility. Arcana are a large part of this. Don't squander this by being lazy with your Arcana selection. Trigger: The Warlock can play this card when a friendly Faction model with a corpse token is damaged by an enemy attack while in the warlock's control range. 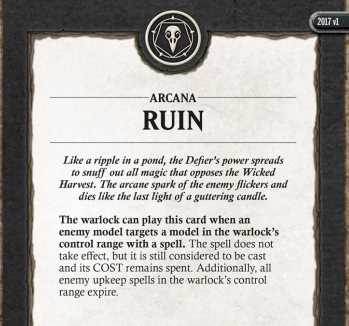 Benefit: While in the warlock's control range, enemy models lose Incorporeal, Tough, and Undead and cannot have damage removed from them. Additionally, enemy non-warbeast models lose Construct while in the warlock's control range. Accursed lasts for one round. Clearly this Arcana does a TON, however it's really hard to trigger. Lets start with only 4 of our models can have corpse tokens, the Skin & Moans, Cage Rager, Dreadrots, and the Death Knell. Getting corpses on them can be difficult under normal circumstances. However we can leverage the Dark Menagerie theme to grant our Skin & Moans, Cage Rager, and Death Knell a starting corpse. This allows us to lead with our heavies, protected by the Death Knell's Warmth of the Grave. The Skin & Moans starts at arm 16 It gets +1 for each corpse token, to a max of three so right out of the gate in DM it gets to arm 17, and the Death Knell brings it to arm 19 if it's within 5 inches. The Cage Rager is just arm 19 right away, and gets "warmed over" to arm 21. I think this is our best and safest bet to get a favorable opportunity to trigger Accursed. The benefits for this one are crazy good. Enemies losing Tough or Incorporeal are clear cut wins. Models losing Construct or Undead aren't as obvious, but can be just as powerful. Losing Construct on the Convergence infantry allows our RFP to work on them. Ghost Fleet losing undead on it's pirates allows the Hollowmen Blood-Bound RFP to work on them. Almost every mechanic unit targets "...friendly Faction construct model." So Warjacks losing construct prevents them from being repaired for a turn. Zaal, the Ancestral Advocate's feat only provides the +5 ARM to "friendly Faction construct model's"
The Wraith Engines "Unhallowed" only provides friendly faction undead models the +2 arm bonus. So as you can see there are a lot of weird, cute and often game changing interactions with Accursed. If you're playing in Dark Menagerie be sure to at least consider it into. Read your opponents cards, and make the best decision you can. When playing against Accursed be mindful of who has corpses, and which of them are in the Grymkin players control range. Consider what the Grymkin player would be able to get in his control range next turn, before giving him the option to trigger Accursed. Don't carelessly throw models away giving him addition corpses early. Try to make him have to think about his Arcana, remember only one can be triggered a turn. Trigger: The warlock can play this card when an enemy model targets a model in this warlock's control range with a spell. Benefit: The spell does not take effect, but it is still considered to be cast and it's COST remains spent. Additionally, all enemy upkeep spells in the warlock's control range expire. Ruin is definitely one of the more popular Arcana, and for good reason. It's pretty straight forward to trigger, an enemy model targets a model in the warlocks control range. This can be an offensive spell onto and enemy model, or a beneficial spell onto a friendly model. Animi are also spells in this edition regardless of whom casts them. *actions and *attacks under "Magic Ability" are also spells. Remember that spells with range of SELF do target the model casting it, and such can be RUIN'd. So the amount of things you can trigger this on is staggering. Timing of this one is important. Ideally you want an idea of what your opponent is going to cast, and you need to know which of those do you really want to stop. You might really want to Ruin Arcane Shield, but by not ruining the JR Warcaster casting Arcane shield you keep your Arcana for the turn open, and have the possibility to Ruin something else, and drop the Arcane Shield with the secondary effect. Keep in mind magic casting units and solos too. Sometimes stopping the Mind Benders adrenal floods is more important than stopping one of Thexus's many Telekinesis castings. Canceling a blind walkers "Rites of Power" can really screw a minion/skorne players turn. Similarly a circle player counting on a Hunter's Mark landing, gets really sad when it doesn't even get cast. For synergies we should keep in mind the Arcane Vortex of the Cage Rager. This allows us to cancel a spell that targets a model within 3inches of the Cage Rager by spending a corpse. As previously mentioned the theme Dark Menagerie gets us a corpse to start the game. An Arcane Vortex, or two plus Ruin really cramps an enemy spell casters style. When playing into Ruin there are a few things to keep in mind. Obviously make sure if you're buffing a unit to target a model outside the Grymkin players control if possible, the model casting doesn't matter here. The model being targeted is the one that needs to be in the Grmykin players control. If you really wanted an upkeep to stay in play, don't give the Grymkin player the option to Ruin it off the table. Remember that Ruin happens before boosting, so all you do is declare the spell and target when the Grymkin player has to make up their mind. Trigger: The warlock can play this card when an enemy model destroys a friendly Faction warrior model in the warlock's control range. Benefit: For one round, enemy models suffer -1 to attack and damage rolls. Ill Omens is a weird one. Grymkin have two BOARD WIDE effects, this being one of them. Once it's triggered it doesn't matter who the enemy model is or where they are, they are suffering -1 to attack and damage. It's straight forward to trigger. But be sure to consider what warrior models you have to trigger it with This is especially relevant in Dark Menagerie. If all you have are Gremlin Swarms, maybe this isn't the best Arcana. Also consider what you're using this one. If all you have are Dreadrots and Hollowmen does this help? How many more attacks does my opponent have, and are they going to be influenced by the -1 swing. The closer to the apex of the bell curve the large impact this Arcana has. If we're stating the obvious it's also much more influential vs large volumes of attacks, then it is against fewer higher pow'd ones. I really like this stacked with the Wanderers Star Crossed. Star Crossed is already a really demoralizing thing to play into, couple that with another def and arm debuff and it's super annoying for your opponent. If we're going to run the Heavy Dark Menagerie Death Knell list it can make a difference too. Pushing the Skin & Moans to Arm 20 , and the Cage Rager to Arm 22 is legit. When playing into Ill Omens it's important to remember your ENTIRE army will be -1 to attack and dmg for the round. So things jam "worse". Solo's across the board are impacted. Etc etc. If possible we want to make sure the last models you attack in your turn are the ones inside the Grymkin players control range. Remember if your opponent is noodling about whether to pop an Arcana slap the clock over to them. Trigger: The warlock can play this card when an enemy model advances into and ends its movement in the melee range of a smaller-based friendly Faction model in the warlock's command range. Benefit: Immediately place a Faction heavy warbeast completely within 5 inches of the smaller-based Faction model. The warbeast cannoy advance, the warbeast is removed from play after one round. The Shadow is obviously a popular one. Some people get confused on the trigger so I'll go over it quickly. When an enemy model with a larger base enters and ends it's movement within the melee range of a friendly Faction model you can trigger it. So a 120mm base into a 50mm. A 50mm into a 40mm etc etc. So first piece of advice is look at your opponents list, look at yours, and see if the trigger is realistic. If you're playing mostly 50mm bases in Dark Menagerie and you see 2una across the table this is not a good Arcana selection. Also remember it's in the warlock's Command Range, not their control. The command range of the defilers vary greatly, be sure not to take this with my beloved King of Nothing. A few other things worth noting, you have to have the model to use this Arcana. So be sure to have a spare Heavy of choice in the bag. I personally prefer the Cage Rager in most situations. I'm assuming the placement gets me rear strike. The Skin & Moans needs corpses to really swing for the fences and getting them over there can be difficult. Though the Skin & Moans has that extra mat and 1 inch more of reach! Lastly Grymkin players don't forget you can use this to get yourself another transfer target. Run those beasts hot. Bait an assassination run on your caster where they assume you have no legal transfer targets. Pop the Shadow and hopefully win off their over extension. For you non Defilers out there it's important to remember you have to end your movement in the melee range of the smaller model. A lot of the Grymkin models only have 1 inch reach, so you can charge your 120mm base into max range and safely not trigger this. The only models with 2 inch reach in the Grymkin faction you need to worry about are Skin & Moans and Witchwoods for 50 mm bases. Gorehounds, The Heretic and Piggybacks for 40mm bases. And only the Wanderer himself has a 2 inch reach weapon for Grymkin on a 30mm base. So be sure to know what the melee range of the Grymkin models are, and use your longer reach to your advantage. Trigger: The warlock can play this card when an enemy model misses a friendly Faction model in the warlock's control range with an attack. 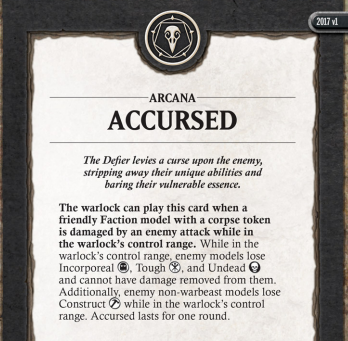 Benefit: For one round, friendly Faction models gain +1 to attack and damage rolls against enemy models in the warlock's control range. The similarities to Ill Omens are obvious. It buffs instead of debuffs, but only when we're attacking models in the Warlock's Control range. Just like Ill Omens, the larger number of attacks we have the large impact this ability brings. Getting our infantry swarms to mat effective 7 is stellar, just be sure the turn you pop this you're going to be making tons of attacks. Remember this effects all damage rolls vs enemy models. So collateral damage, Mad Cap damage, and any other weird damage roll is effected as long as the enemy model is in the warlock's control. Our mat's hover around the 6 area with a few poking up to 7. So the hit buff this brings us can be huge. Given where we normally fall on the bell curve of hitting this buff can be huge. When thinking about Arcana selection know your opponents defensive stats, and see where on the bell curve the meat of your list falls against them. Playing around this one is simple. Just don't miss! I kid, but honestly you might not want to take the hail mary attacks, especially if it's late in your turn and the Grymkin player hasn't used an Arcana yet. Keep in mind the amount of damage buffs Grymkin have access to, often helping us hit is enough to allows the buff stack'd Grymkin to rip through basically anything. So there we have it, 5 of the 15 Arcana are covered with some basic tips for using, selecting, and playing against them. I hope this helps you in your games and would love to hear anything you disagree with! Stay tuned for part 2 where we cover the rest of the general Arcana. And part 3 where we cover the Trumps.